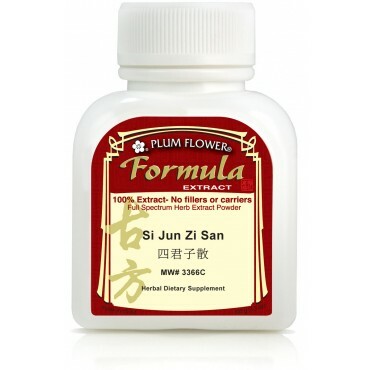 This is the foundational Chinese herbal formula that all digestion formulas are based upon. Deficiency of qi causing fatigue, loose stools, poor appetite, weak limbs, weak voice; digestive disorders, gastritis, ulcer; adjunctively for spleen qi manifesting as weak cough, difficult breathing, recovery from childbirth or chronic illness are some of the imbalances satisfied clients have used this product for. 3 grams 3 times per day or 4.5 grams 2 times per day or as directed by your wellness coach.